In addition to her parents, she was preceded in death by her husband of 53 years, Norman “Red” Parsons; one son, Donnie Parsons; and one brother, Earl Stewart. After graduating from Prichard High School in Grayson, Kentucky. Ruth attended business school in Huntington, West Virginia. 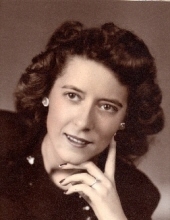 She was a secretary and stenographer and worked in offices in Grayson and Olive Hill, Kentucky; and during World War II in the Postal Service Department in Washington D.C.
Friends may visit from 1 p.m. to 2 p.m. Monday, February 11, 2019, at Globe Funeral Chapel, 17277 West Highway US 60, Olive Hill, Kentucky 41164. "Email Address" would like to share the life celebration of Ruth Stewart Parsons. Click on the "link" to go to share a favorite memory or leave a condolence message for the family.